The historical Buddha was born in 463 B.C. as Siddharta Gautama, a prince in a small tribal kingdom of the Shakya clan in southern Nepal. Becoming dissatisfied with palace life, Siddharta renounced his life as a prince and become a wandering ascetic dedicated to finding the answer to suffering itself. For six years, Siddharta lived a life of severe self-denial and discipline. He hoped these practices would give him the insight he needed to find his answers. After six years, his body so weakened and close to death, he was no closer to his goal than when he started. He realized that self-denial was as much of a hindrance to achieve self-awakening as self-indulgence. Regaining his health, he went to the base of a fig tree and sat in deep meditation. He cleared away all distractions in his mind and awoke to the ultimate reality. 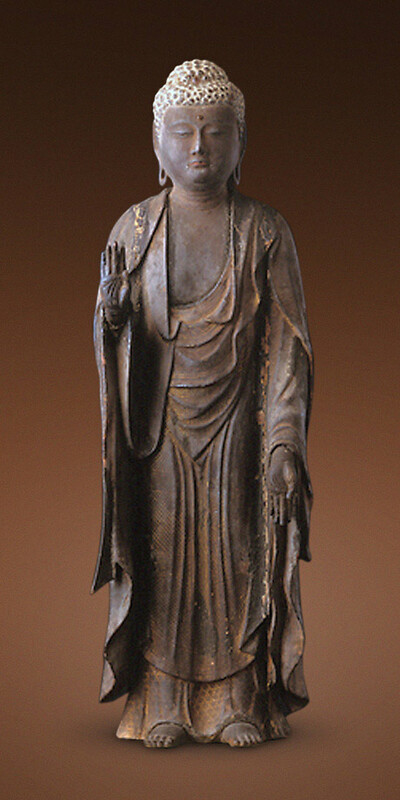 He became a Buddha or “Awakened One.” From that point on, he was called Shakyamuni Buddha: the sage of the Shakya clan. Out of his compassion, he set out to share his insight. For the next 42 years, the Buddha traveled throughout India teaching people according to their ability to understand. Gradually, he raised their level of understanding to the point where they were ready to receive his highest teaching, the Lotus Sutra. The Buddha taught the Lotus Sutra for the last eight years of his life. He passed away peacefully in a grove of sala trees in the year 383 B.C.